« HD SDI DVR recorders. Is the data safe? Fixed fees for annual NSI membership? Recently in the security headlines was the news that Stanley security solutions had been elevated to gold membership of the NSI. This is no mean achievment for an organization of the size of Stanley and very welcome news for the NSI itself. The reason the NSI will be rightly overjoyed is the new money that Stanley will bring to the organization. 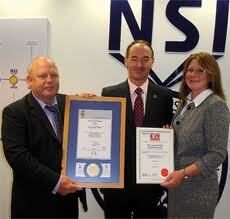 Being a gold NSI member means every aspect of installation work will need to be certificated. So a simple door access system will cost Stanley a small but by no means insignificant amount and the same goes for a CCTV system and an intruder alarm. The NSI have been funded by charging member companies for certificates since its inception but the financial downturn has had quite an impact on the number of systems being installed and thus the number of certificates being issed. less certificates equals less revenue. This has led the NSI to have a re-think about how it can possibly fund its operation going forward and as result the idea of a fixed fee for membership has been mooted. This could have a huge impact on smaller installers who quite possibly would have to pay the same amount to issue 10 certificates per annum as some of the larger organizations who issue thousands per year. Is this fair? Well its not been confirmed yet but it seems that by even thinking about this route forward the NSI is making every effort to ensure its own survival in very difficult times but at what cost to the overall security industry itself? We sense a potential rift and opportunity for other inspectorates to step into the breach, we will have to wait and see but we sense a shift of allegiance for many security companies could be just around the corner. NSI, SSAIB why they are needed within the CCTV industry. This entry was posted on Thursday, October 18th, 2012 at 19:45	and is filed under Access Control, CCTV, Intruder Alarms. You can follow any responses to this entry through the RSS 2.0 feed. Both comments and pings are currently closed.